Long before Kate Middleton and Meghan Markle became the center of royal attention, the queen's sister Princess Margaret captivated the public and garnered her fair share of headlines. Although she was often known as the scandalous party princess - in contrast to her always-proper sister - Princess Margaret was still a beloved royal and an icon for a generation of girls. It seems only natural, then, that when the princess came of age in 1951, her 21st birthday party would be one to remember. Now that her prized birthday gown is on display in London, we're revisiting the details of the momentous occasion. The centerpiece of the party, was, of course, what the princess was wearing, and Princess Margaret certainly did not disappoint. She selected a gown by French designer Christian Dior, made of creamy organza silk, featuring an off-the-shoulder cut and a massive, full skirt, and covered in detailed embroidery, sequins, and mother-of-pearl. While her sister, the future Queen Elizabeth, had to be seen to be loyal only to British designers, Princess Margaret had more fashion options, and she took full advantage of that to utilize the talents of the top names in couture. In fact, she apparently loved this Dior gown so much that she wore it for multiple events. "I imagine she had a very fun time in that dress," Museum of London assistant curator Connie Karol Burks told People at a preview of the exhibition that includes the gown. "It was one of her favorite dresses and she wore it more than once – there are photographs of her wearing it in Paris at an event later that year." 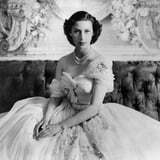 The princess's party had one shadow lingering over it: the worsening health of her father, King George VI. By the time Princess Margaret turned 21 in 1951, the king's many health issues - made worse by the stress of World War II and his heavy smoking habit - were piling up. Only a month after this party, in fact, he would undergo surgery to remove part of his left lung after cancer was found, and the princess would assist the rest of her family in picking up some of his duties. Her 21st would be the last birthday she spent with her father; he died in February 1952. For the venue, the family chose the royals' Scottish estate of Balmoral. According to the castle's website, it entered royal possession in 1852, when Prince Albert bought the property for his wife, Queen Victoria, since the couple loved their visits to the Scottish Highlands so much. The castle that stands there today is not, in fact, the original one: Albert and Victoria decided the existing castle was too small for their sprawling family, so they built a new castle on the grounds, which was completed in 1856. Since then, the royals have kept the estate as a favorite getaway. The Queen spends every summer there, according to Town and Country, and it is reportedly her favorite of the many royal residences. Princess Margaret's 21st birthday was indeed memorable, both as one of the last celebrations the family enjoyed together and as an official introduction of the princess into society as an adult. Although her style definitely evolved over the years, her Dior gown remains a symbol of the young princess and the glamour of the royal family of the era.